How do you combat that paralysing feeling of paralysis you get when the problem is just too complex to tackle? The answer is quaductionism. I know what you’re thinking; you’re thinking that I just made this word up. That’s okay, because I did. But only because I needed a single word to sum up the awesome power of this common and simple reductionism trick. Whenever there is a complex problem full of variations, subtleties, and exceptions – some smart person will reduce the problem to just two key variables, and chart their relationship using four quadrants. The reason that this always seems to be done by a smart person is that it takes a lot of skill to cut through the problem to find those two key variables. Once they have been identified, the problem loses its menacing nature. 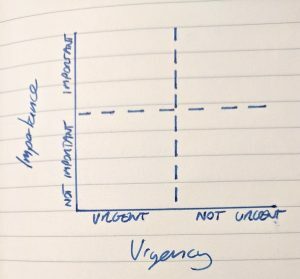 We can immediately ignore the bottom-right quadrant, which represents things that are neither urgent, nor important. We ought to then turn our attention to the top-left quadrant, which is both urgent and important. If we value longevity, we can then tackle the non-urgent important stuff. (There is an alternative pattern, whereby you “tactical yourself to death” by heading from the top-left to the bottom-left. The result of this is that the stuff on the top-right keeps moving into the top-left). Quaductionism itself isn’t the end of the process. It is often just the first step in breaking things down into something manageable. Once you overcome the first hurdle, you’ll probably want to start allowing some additional complexity into your model, otherwise you may just be over-simplifying things. Covey embraced quaductionism in his book, but he wrapped it up in a chapter that explained things in more detail. The quadrants were not the end of the story, they were the start of it. So if you are facing a really tough problem, seek out those two key variables and draw up quadrants to learn how they relate to each other conceptually. It will help you get past that cliff-face of complexity.